The DNS Client service (dnscache) caches Domain Name System (DNS) names and registers the full computer name for this computer. If the service is stopped, DNS names will continue to be resolved. However, the results of DNS name queries will not be cached and the computer’s name will not be registered. If the service is disabled, any services that explicitly depend on it will fail to start. So the DNS Client is responsible for caching the results from the DNS Resolver, and register the computer’s FQDN in Dynamic DNS. If you stop the DNS Client you can still resolve names, but they will not be cached and a DNS Server will be queried each time a name needs to be resolved to an IP address. Needless to say, this may impact performance. Name resolution works the same for both Windows clients; XP, Vista, 7, 8 etc., and servers; 2003, 2008, 2008 R2, 2012. Both servers and clients need to be able to resolve, cache and register network names and they all do it the same way. The DNS Resolver sends the name query to the first DNS server on the preferred adapter’s list of DNS servers and waits one second for a response. If the DNS Resolver does not receive a response from the first DNS server within one second, it sends the name query to the first DNS servers on all adapters that are still under consideration and waits two seconds for a response. If the DNS Resolver does not receive a response from any DNS server within two seconds, the DNS Client service sends the query to all DNS servers on all adapters that are still under consideration and waits another two seconds for a response. If the DNS Resolver still does not receive a response from any DNS server, it sends the name query to all DNS servers on all adapters that are still under consideration and waits four seconds for a response. If the DNS Resolver does not receive a response from any DNS server, the DNS client sends the query to all DNS servers on all adapters that are still under consideration and waits eight seconds for a response. If the DNS Resolver receives a positive response, it stops querying for the name, adds the response to the cache (via the DNS Client service) and returns the response to the client. If the DNS Resolver has not received a response from any server within eight seconds, the DNS Resolver responds with a timeout. On a Windows machine with one network adapter, which is bound to the TCP/IPv4 protocol, with two or more DNS servers specified in its TCP/IP properties; if the primary DNS server does not respond the machine will not fail over to the secondary DNS server and will be unable to resolve names. I used this setup to test. 2 Windows Server 2012 DC/DNS servers named MAYA1 and MAYA2 with the addresses 192.168.131.10 and 192.168.131.11 respectively. Both have the same DNS zones and configuration, i.e.. they will both answer with the same information when queried. 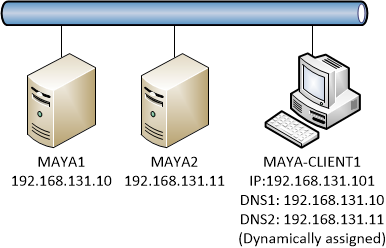 A Windows 8 Professional client, named MAYA-CLIENT1, with a dynamically assigned IP address from MAYA1, acting as a DHCP server, and 2 dynamically configured DNS servers (MAYA1 and MAYA2) in that order. All machines on the same subnet. The test I did was very simple. With Network Monitor running on the client I first pinged the name nothere1. In Network Monitor I verified that the response had come from MAYA1 (the configured primary DNS server). I emptied the DNS cache on the client and disconnected MAYA1 from the network. I then pinged nothere1 again, using Network Monitor to see which server answered. It should come as no surprise that this worked exactly as expected. Under normal conditions Windows will use its configured primary DNS server, if that fails it will use the next configured server on the list after a short delay. These tests were performed with Windows 8 as the resolving client. It is quite possible that an earlier version of Windows behaves differently, but nothing I have found suggests so. Testing of that will have to wait for the time being, though. I did come across people who reported variations of the problem originally stated in this post, but none with the exact same result. Some people were able to log on to their domain and resolve names successfully when the primary DNS server was offline, but were baffled that nslookup did not work. I guess they didn’t know that nslookup always queries the primary DNS server. Some documentation claims that it is the DHCP Client service (service name Dhcp) that registers the computer’s FQDN with DNS. I have tested this on the setup used in this article and have not been able to reproduce that behavior. This article; How to configure DNS dynamic updates in Windows Server 2003, claims that the DHCP Client service registers the name even for statically configured addresses. A funny thing here is that the service description for the DHCP Client service also claims that it registers addresses: Registers and updates IP addresses and DNS records for this computer. If this service is stopped, this computer will not receive dynamic IP addresses and DNS updates. If this service is disabled, any services that explicitly depend on it will fail to start. I also remember reading about this in the Windows 2000 days, so maybe this was the way it worked before? So far it looks like Windows behaves exactly as you would expect! That is always nice. Just stopping it will not work because Windows will restart it as soon as you start resolving names. Ping your favorite DNS name and marvel at Windows’ ability to resolve the name without the benefit of the cache. Instead of the usual list of cached DNS names you will see this error: Could not display the DNS Resolver Cache. No dice; this error pops up: Could not flush the DNS Resolver Cache: Function failed during execution. Fail: Registration of DNS records failed: The binding handle is invalid. Sit back and enjoy your deep understanding of DNS on Windows. Re-enable and restart your DNS Client service.